This will mainly work as a tournament and it will be based on the result of the effect dice. Jaystar will say the couples that will compete with each other and each rper will have to roll the effect dice. The one who gets the higher number wins. If you get the same number, you will have to roll it again ;D. In order to keep things going, you will have 48 hrs to post from this topic or you'll be disqualified. Further rules for the second round will be explained later. Another day and another event of the festival started. Jaystar walked with the rest of his warriors to the Sunningrocks, the place of the river he had chosen for this special competition. The river was deep enough and since the whole of both sides of the river belonged to them, it was fine. The large leader made his way to the rocks and sat down on top of the tallest, so everyone could pay him attention. "I welcome all of you to this special event and beforehand, I'll like to thank you for your participation. After what happened with Shade and Lichenmask, is time to enjoy life and prepare ourselves for the leaf-bare. That's why I've decided to make this competition not only as a game to relax and have fun but to also train our bodies for the harsh season. With that being said, let me explain you the rules." Jaystar flicked his tail and pointed the river, his gaze gazing to the selected place for the races. "Each of you will compete against one of your clanmates in races of two. You will reach the other side of the river and then come back to this rock where I'm standing. The winners of each pair will pass to the second stage for another race until we have one winner." He leapt down the rock and looked over his fellow warriors, choosing the pairs for the swimming race. "Hailsong with Littlestream. Lightstep with Ravenflight. Snowblossom with Scorchclaw. 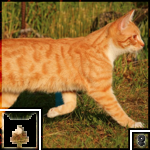 Gingerstripe with Mottledspark. Swanpetal with Heronflight. Flurryshine with Silverfang." He mewed, nodded satisfied with the selection. The leader walked back to the rock and sat down next to it. This time, he would be the only supervising the competition so he had to pay extra attention to every racer. "Now, all of you go to the shore and wait for my start... in the count of one... two... three... go!" Gingerstripe's tail-tip flicked nervously, the only sign of emotion anywhere on him. His face was straight, his posture tall, but his twitching tail gave away how he felt. 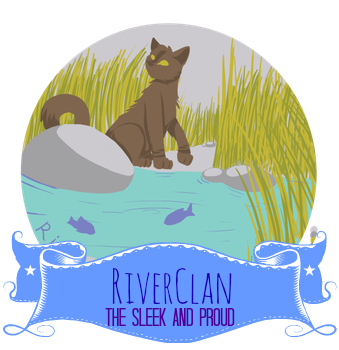 He wasn't sure why he'd decided to sign up for this, only to continue showing his loyalty to RiverClan and maybe see how his swimming skills were. Now, he was having second thoughts- but this was no time to get cold paws. The Clan needed some lightening up, and if he failed miserably, at least everyone would have a good laugh at it! He nodded at Mottlespark, his competitor- a good but young tom- and waited for Jaystar to give the signal. When the leader did, he immediately dove into the river, hesitation forgotten, plunging down into its dark and cold depths before surfacing for a breath and beginning to swim. Snowblossom was anxious as well. She knew that she was good at swimming- the pelt that she'd inherited from her aunt and given to her daughter was thick and waterproof, ensuring that she was definitely built for it- but that still didn't mean that she couldn't be nervous. Competitions of any kind weren't her strong suit, but she wanted to be here to support her daughter. However, she was beginning to calm down- until Jaystar announced the partners. She was racing against Scorchclaw- the deputy! Her heart began to race, and her green eyes grew bright with panic. A former queen against such a young, strong tom... well, she would do her best. When Jaystar said "go", she dove into the water with a practiced form and began immediately to swim, like she had done all her life. However, she was very out of shape, and Scorchclaw easily won when they reached the starting line. She was somewhat disappointed, but a little relieved- at least her part in this was over. As he stood on the shore, waiting for the signal from the RiverClan leader, Scorchclaw still wasn't very sure why he was participating in the swimming competition. When Jaystar had first told him about the games, he had thought of them as a good idea. In addition to allowing the clan a much-needed time of enjoyment, they would also serve as preparations for leaf-bare. The apprentices had done surprisingly well in the hunting competition yesterday, and the fresh-kill pile had ended up being quite the impressive sight. Then the next morning had rolled around, and he had somehow found himself as one of the participants in the swimming competition. He supposed he didn't really mind. Swimming had always been one of his favorite activities. Not unsurprising for a RiverClan cat, the river usually soothed him. Winning or losing aside, he would just put his all into it. His opponent was Snowblossom, a fluffy white molly. He shot her a quick glance, nodding slightly when her gaze met his. Whether or not she saw his gesture, he had no idea. When he was certain that his tufted ears had registered the word, Scorchclaw plunged forward without hesitation. Mud and pebbles gave way beneath paw. Kicking out with swift, strong strokes, he made his way through the water. To the opposing shore and back--he remembered the instructions quite well. Not bothering to check the progress of the other participants, he focused only on his own swimming. When at last, he was back at the starting line, he stood and looked around. It seemed that he was the winner of his pair, but not by too much. Heronflight was pretty nervous for the swimming race. He knew that he was a very good swimmer, but how good was he compared to everyone else? The gray tabby tom hoped that everyone would do well, but the gray tabby tom would try his best to come out victorious. Just as when Jaystar said, “Go,” the gray tabby immediately started swimming towards the other side of the river. The gray tabby was not doing as well as he had hoped, and he was getting tired from swimming from the other side of the river back to the rocks. You can do this, the gray tabby encouraged himself. When he reached the rocks, he was exhausted. He somehow managed to do well, he thought, but he did not know if Swanpetal beat him. The gray tabby tom waited for Jaystar to announce the next round. Swimming was one of the few things Swanpetal considered herself genuinely good at. Despite her feigned confidence, however, she was still nervous: these were other cats that were mostly close to her in skill, or even outmatched her. Had she ever seen Heronflight swimming, she wondered? Well. 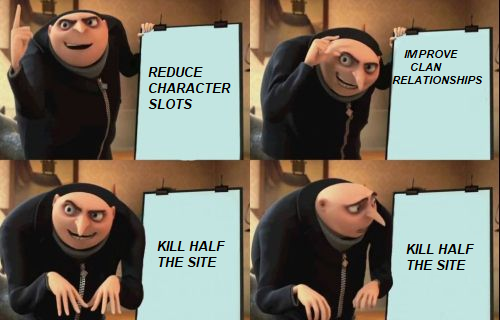 It didn't matter just yet. She had to focus on herself, not her opponent: that would almost guarantee her loss. As Jaystar counted down, she took a moment to clear her mind and focus on nothing else but the body of water before her, and when he said 'go', she shot off. She felt like she had done rather well, but when she reached the end, she realized she had lost by quite a bit. She took a deep breath and supposed she would have to train harder in the future if she wanted to succeed. Ravenflight had been swimming since she was a young apprentice, but she still wasn't sure how she felt about it as a competition. This was supposed to be fun, though, so she decided to make the best of it. She listened carefully as Jaystar explained the rules, which didn't seem too complicated. She readied herself on the riverbank, and at Jaystar's signal she dove into the rushing water. She was a strong swimmer, and didn't have much difficulty as she glided through the river. She finished ahead of Lightstep, the young tom who was competing against her, reaching the riverbank a few moments before he did. At first, Hailsong was surprised when her father told him that he was organizing such an event for Riverclan but she couldn't deny it sounded... exciting. Even if she didn't win, a game was always something that made cats smile and have fun. Riverclan needed a moment like this and the dilute calico she-cat was so ready to enjoy it the best she could. The experienced she-cat smiled at her sister as soon as she knew they were going to compete together. Both of them inherited the short legs of their mother so it would be a real challenge for both of them. Hailsong nudged her playfully as she walked to the shore, with a smile. "Let's have some fun, sis. Like in the old times." She purred before Jaystar could give the start. As soon as he raised his voice, the small cat leapt forward into the water and it just felt right. Her paws moved naturally as she swam as fast as she could to the other side, avoiding to crash with the other warriors. Mottledspark and Lightstep waited among the gathered competitors at Sunningrocks, pelts sleekly groomed and oiled against their bodies. Mottledspark's paws worked impatiently at the ground, but Lightstep remained still and calm, looking up at Jaystar expectantly as his grandfather began to speak. Lightstep made brief eye contact with Ravenflight, nodding his head once in friendly acknowledgement. 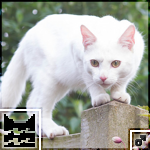 The sleek white tom padded over to the starting line next to his opponent, his twitching tail-tip and glimmering yellow eyes the only signs of his excitement. When Jaystar gave th signal, the tom took an elegant leaping plunge into the river, swiping out with skilled paws through the cold current that shocked his body. Mottledspark's response to his competitor, however, was less than friendly. Really? 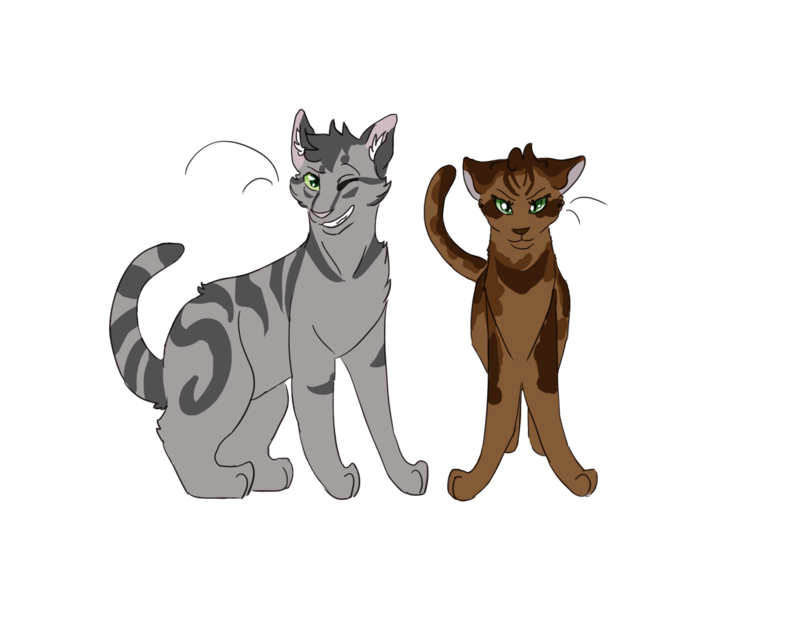 the dark tortoiseshell tom thought as he shot a surprised look towards Gingerstripe, I thought this was supposed to be a RiverClan competition; why would he put us against a cat who isn't even from RiverClan? The new warrior didn't care what his Clanmates said or believed about the other tom's loyalties right now. 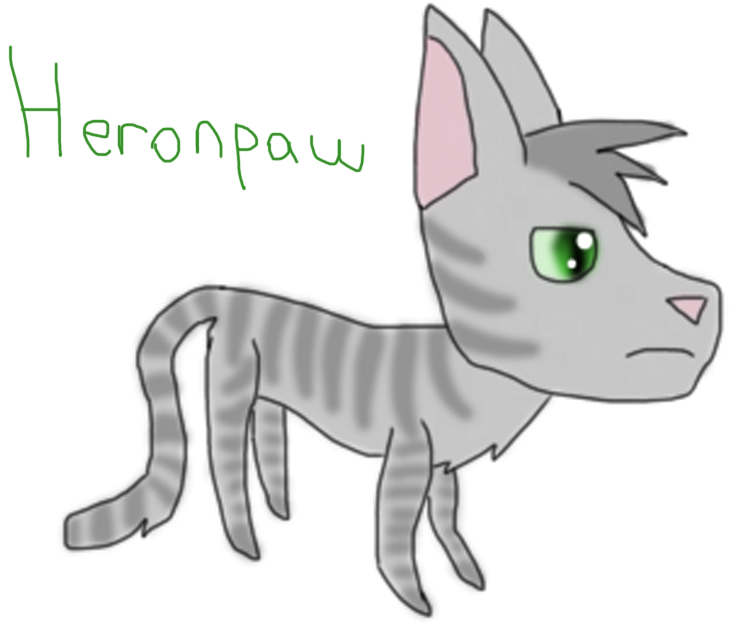 How could a former ShadowClan cat possibly swim as well as he could? Mottledspark trudged over to the starting line next to his opponent, muttering, "Good luck." You'll need it. Then the call rang out, and the thick-furred tom plunged into the water beside his competitor.